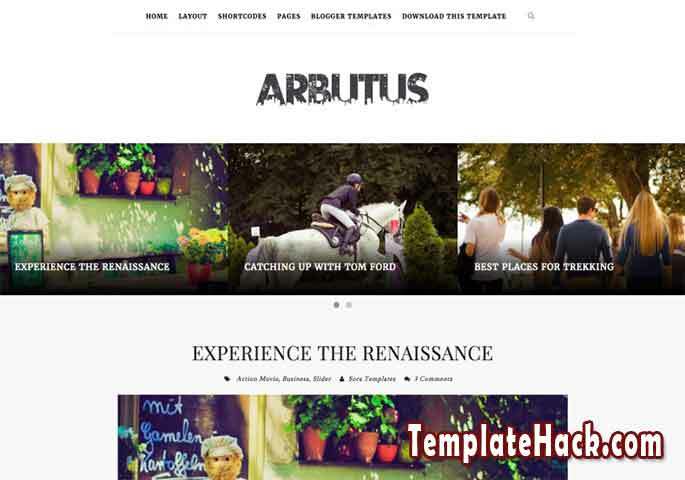 TemplateHack.com - Download Arbutus Responsive premium blogger template. Arbutus is girly fashion blogger template with white base color will make your blog look more great. It is simple and minimalis blogspot template design with no sidebar, no widget and highly compressed resource for fastly loaded. Use this template for your gallery blog, fashion blog, photo blog, lifestyle blog, personal blog, photography blog and magazine blog to make your blog look more unique. With search engine optimized, any content of your post can compete with other similar article from other blog on Google Search Engine. 1 column, 3 column footer, No sidebar, Clean, SEO Friendly, Personal page, Page navigation menu, Responsive, Post thumbnails, Girly, Social bookmark ready, Minimalist, Video, Clean. Gallery blogger template, Magazine blogger template, Video blogger template, Photo blogger template, Personal blogger template, Fashion blogger template, Lifestyle blogger template, Photography blogger template.